The crest - a harpy - is that of Sir John Astley, a renowned jouster of the mid-15th Century, and the armour is based on English tomb effigies of the period. Card size - 150mm x 150mm. 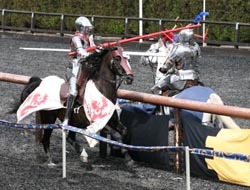 Graham Turner took part in his first joust in 2004, and his jousting experiences since then have had a dramatic influence on his paintings, which convey a sense of immediacy and realism that can only come from such a deep understanding and involvement in this dramatic medieval 'extreme sport'. 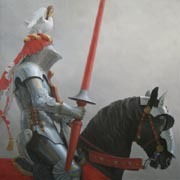 CLICK HERE for details of other jousting paintings, prints and cards by Graham Turner, and for links to other pages on the Studio 88 website where you can see photos and find out more about Graham's jousting career.